Hunters dug a deep pit one day in the hopes of catching a wild tiger that had been eating the lambs from their flocks. They had seen the tiger and knew him by sight. They dug the pit deep so it had steep sides that nothing could climb out of. It was too narrow for any creature to be able to run and pick up speed to leap out. Whoever or whatever fell into the pit would not get out on its own. They carefully placed several bamboo poles over the pit. Then, they placed giant leaves from the forest trees over the poles. They sprinkled grass over the leaves making the covered pit look like part of the forest floor. But it was not the tiger who fell victim to the pit. A panther was walking along the path one day and did not see the pit that had been dug by the hunters. His interest was on catching a deer for his dinner, and he fell into the pit. The villagers discovered him. They knew that this was not the animal that had been stealing from them. Panthers do not look at all like tigers. This Panther had even chased away monkeys and rats that had been eating from their fields and had done them a good turn in the past. Still, many threw sticks at him and pelted him with stones. They yelled at him, taking their anger for the tiger out on the Panther, who had done them no harm. There were other villagers who were more compassionate and caring. They begged their friends not to hurt the Panther and even threw him food to keep him alive. That night all the people went home expecting to still see the Panther in the pit the next morning. But during the night, a giant wind broke a branch from a nearby tree. The branch fell partly into the pit, giving the panther a way to use his strong claws and climb out. Only a few days later, cattle and sheep began to disappear in larger numbers than ever. But it was strange. The animals that were eaten all belonged to the villagers who had abused the Panther and who had been cruel to him. 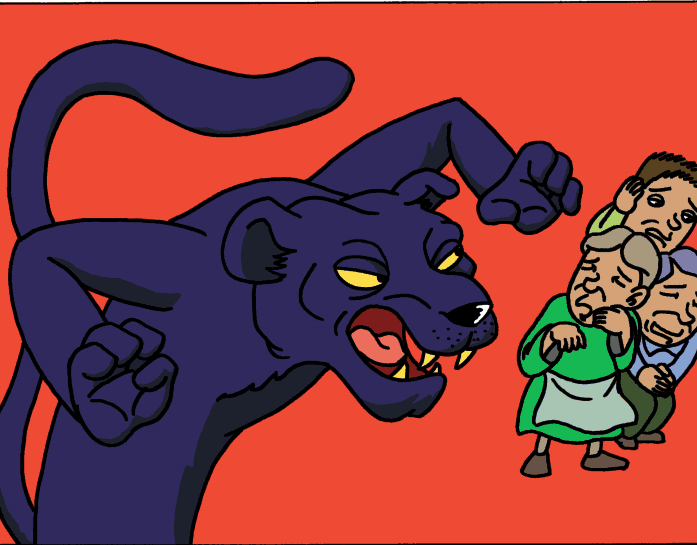 The villagers cried out to the Panther. Spare our animals. We need them to live. The Panther came to the edge of the forest and replied, "I remember alike those who sought my life with stones, and those who gave me food. To those who treat others with kindness have no fear. I return as an enemy only to those who injured me and who would do harm to others."